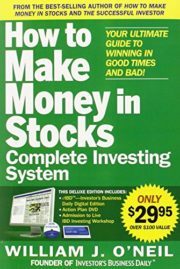 Anyone Can Learn to Invest Wisely With This Bestselling Investment System! Through every type of market, William J. O’Neil’s national bestseller How to Make Money in Stocks has shown over 2 million investors the secrets to successful investing. O’Neil’s powerful CAN SLIM Investing System–a proven seven-step process for minimizing risk and maximizing gains–has influenced generations of investors. Strategies to help you avoid the most common investor mistakes! The American Association of Individual Investors 12-year study of over 50 leading investment strategies found O’Neil’s CAN SLIM System to be the top-performing strategy. CAN SLIM produced 2,763.3% over the 12 years vs. 14.9% for the S&P 500. Get your first month of eIBD now at investors.com/system. Then, watch the enclosed Action Plan DVD that gives you a quick overview for using eIBD. At this three-hour workshop, IBD experts will give you an overview of the CAN SLIM System and provide an action plan for using key features and investing tools. Call 1-800-831-2525 to register for the workshop nearest you. This book gives you the foundation for your investing success, so be sure to read each chapter carefully. Follow these three steps and you’ll be on the path to being a more successful investor.